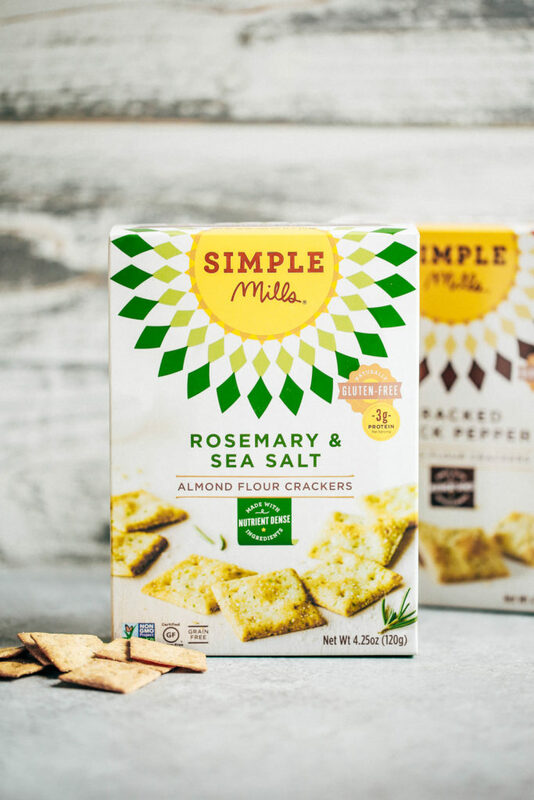 THIS POST IS SPONSORED BY FRIENDS AT SIMPLE MILLS! 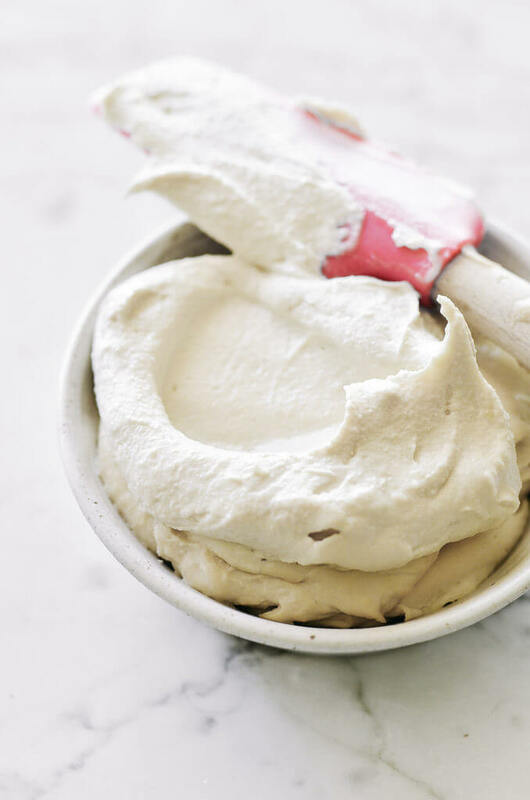 This dairy free cream cheese will blow your mind with it’s rich creaminess. I am only speaking from experience. Because this stuff has changed the way I eat! The element of having something rich and creamy in a recipe was lacking in my life. Since discovering dairy free cream cheese, everything tastes better! I can say without a doubt- I have yet to find a recipe, savory or sweet, that doesn’t go well with this cream cheese. It’s simply divine. Isn’t it a joy when you can make one of your favorite recipes in a food processor and have it ready in minutes? That’s how I feel about this cream cheese. Just give it to me! 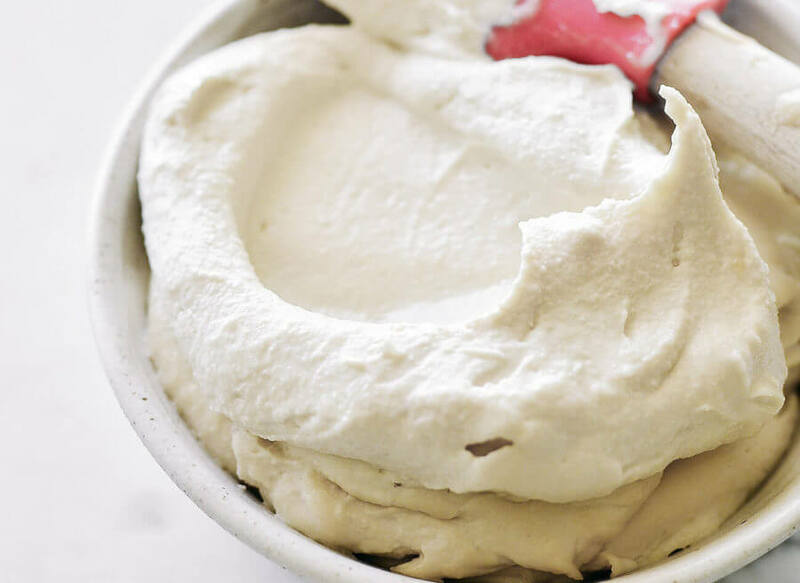 It only takes four ingredients and a food processor (or high power blender) to make this dreamy cream cheese. 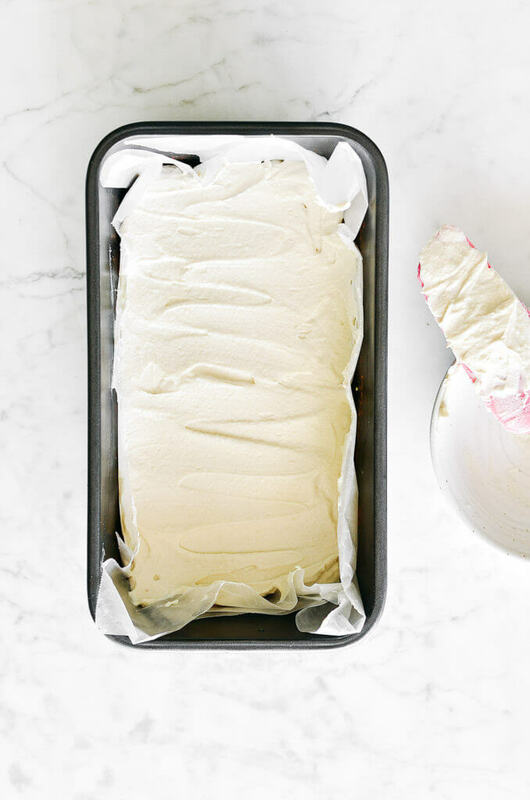 *Pro tip: make these dairy free raspberry cream cheese bars with this cream cheese recipe! It’s literally one of the best things I have even had in my life. Not joking. the instant cream cheese recipe you need! When I was a kid my brothers, sister, and I would make it our after lunch ritual to make mini, self-assemble, five minute cheesecakes. To do this all you need is your favorite cracker, your favorite jam, and cream cheese! Spread a little jam over your cream cheese on a cracker and you instantly have some crunch with some smooth… cheesecake! P.S. My favorite variety is the Sun Dried Tomato and Basil Almond Flour Crackers, YUM. The best news: these almond flour crackers are available in Safeway’s across the Pacific Northwest- so don’t walk, RUN. Single serving size of cream cheese isn’t a bad idea either. It just so happens that it’s one of my late night snacking go-to’s. Dipping the finger in the cream cheese jar… ohhhh ya. I can’t wait to see what you think! 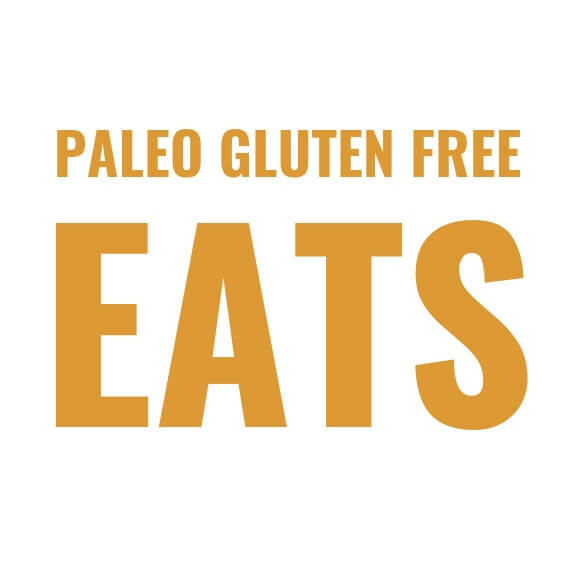 I hope you love it just as much as I do… and find many lovely ways to use it in your paleo meals. 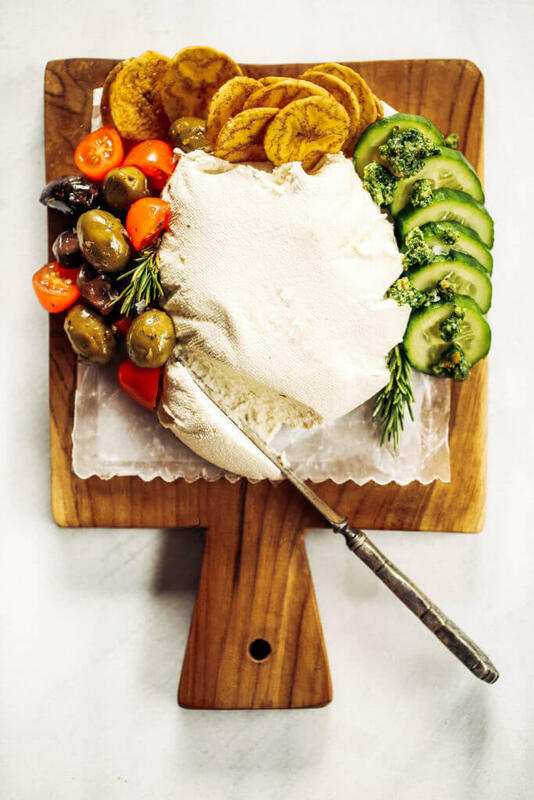 Dairy free cream cheese FTW! Looking for more dips and sauces in your life? You have the name of this as Diary, and not dairy. Just trying to help.. It says to “soak in hot water for 1 until soft” Is that 1 minute? Hour? Day??? Oh Patricia! My goodness, looks like my brain was working faster than my hands for forgot to type the hour part! 🙂 Yes, it’s 1 hour a least. I soak them overnight if I can, but an hour works too. Just fixed this on the recipe. Hello there! Just a quick question 🙂 When you place the cashews in the processor is it only the cashews or the cashews and water they were soaked in? Thanks! How many tablespoons is a serving? 1 or 2? I can’t wait to try this! Hi Violet, it’s one tablespoon per serving. Hi Jen! Sadly… No, avocado oil is too liquidy and would change the texture to liquid. I’ve a food allergy to cashews, but not to almonds or walnuts. Could I use soaked walnuts instead to make this dreamy and creamy delight? Brilliant! I happened to buy a whole kg of cashews yesterday – so glad I did! Recipe is bookmarked! 😀 Thank you! And stunning photos! Do I drain the water from the soaked cashews? Yes, the water is drained. I will make a note of that on the recipe. Thanks! Bonjour, si vous ne lisez pas le français, j’ai ajouté la traduction plus bas. Je suis très contente de trouver cette recette de fromage à la crème sans lactose. Merci ! Ma question portait sur les amandes naturelles en remplacement des noix de cajous, mais elle a déjà été posée. Je crois bien que je vais l’essayer en petite quantité. Par contre, je n’ai pas d’huile de noix de coco puis-je utiliser d’autres sortes d’huiles ? Hello, excuse my English, it’s a tranlation…. I am very happy to find this recipe for lactose-free cream cheese. Thank you ! My question was about natural almonds instead of cashew nuts, but it has already been asked. I think I’ll try it in small quantities. On the other hand, I do not have coconut oil, can I use other kinds of oils? Hi! Is there any other oil besides coconut that I can use? Hi Terris, there isn’t but you can leave it out. It was super lemony – like, over powering. Do you think it would be possible to leave it out or cut it and replace with more water? Is there another nut you could substitute for cashews? I have a sensitivity to cashews but I’d really like to try this! when you soak them overnight do you put them in the refarigerator? Hi Bev, I just leave them on the counter and cover them with a lid. Hi Kaylie, is that 2 cups dry measured and then soaked or is that cups after they have soaked? Not sure if cashews swell with soaking like chickpeas do or just soften so I thought I’d make sure my measure was accurate. Hi Ange, it’s cups of dry cashews- they will expand after soaking! If my cashew cream (plain) has soured, is it bad to use? It is over a week old. Thought it might make a more authentic cream cheese taste? I did use the water because it seemed too thick, would that make it sour? Hi Marianne, I am not quite sure what made it sour- the moisture mixed in with the nuts is my guess. Can’t wait to try this, looks amazing. Do you think this would work if I added strawberries to make strawberry “cream cheese”? Love this.. I will definitely try it out.. I have been looking for an easy dairy free cream cheese option for my bagels, and I love this recipe! I added strawberries to mine and it was delicious! The kiddos even liked it! It looks yummy, cann’t wait to trying this recipe. How much does this make? 4oz? Or less? Hi Joetta, I haven’t weighted it, but just by sight I would say that it makes around 8 – 10 oz. Would this work in a cheesecake recipe? I love cheesecake, but dairy years me up inside. I really wish that I could find a good dairy free substitute that would work in cheesecake. Hi there! Wondering how well this would do heated, if you’ve ever tried. I have a Vegan friend and another who is allergic to dairy and saw this and thought I could make a hot spinach and artichoke dip using this as part of it. But I don’t know how this faux “cream cheese” would hold up to being heated. This alternative cheese sounds great unfortunately we have a cashew nut allergy in the house, do you think macadamias would work too. That may work… I haven’t personally tried it so I cannot say for sure. What can be used instead of lemon juice? This is soooooo good! I paired it with your bagel recipe. I did want to note that I added Himalayan sea salt & it made a huge difference. It cut the sweetness of the cashews and eliminated the lemon flavor without affecting the tartness. The taste is almost indistinguishable from dairy cream cheese. I’m in love! The other non dairy cc recipe I used involved 2 days making homemade rejuvelac! 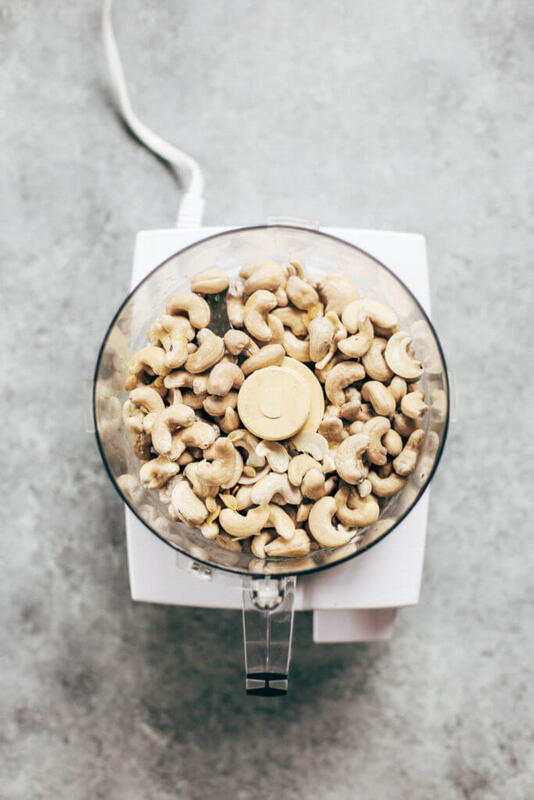 The whole process truly took 5 minutes as I always have soaked almonds and cashews on hand. I’m not sure… I haven’t tried before. Just a quick question on the coconut oil. Should it be melted? Hi Shwetha, I just solid coconut oil. Could I use this “cream cheese” to make cheese cakes? I have a bad dairy allergy (not IBS) but love to make and eat cheesecakes. Would this work? Hi Kricket, I use this recipe for no bake paleo cheesecakes and love it! Perfect recipe thank you. I used the cream cheese in low-carb bagels and they came out delicious! Hi! 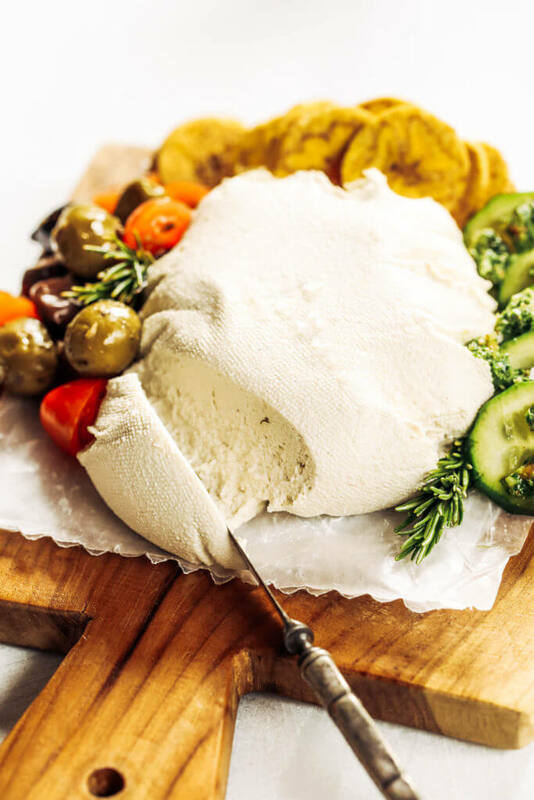 Can I use this dairy free cream cheese to make cheese cake? The heat wouldn’t change the texture? Hi Zara, I haven’t tired so I’m not sure- if you test it out let me know how it goes! Ok I just read the latest comments regarding heat! Thank you! What’s the serving size amount? 1 tablespoon is 1 serving. Can I use this in cookies recipes that call for cream cheese in the dough? Hi Mary Beth- I have never tried before, so I cannot say. Hi Regina, I use solid coconut oil in this recipe. Even after soaking the cashews overnight -nearly 24 hrs.- when I used my Vitamix it cane out smooth but still very slightly chunky. I added another Tablespoon of water to help the mixture rotate more in the food processor. Is it supposed to be slightly chunky or is there anything else I could do? I added a couple more tablespoons to my batch until my vitamix food processor could be put on level 7. The mixture got warm and finally became smooth. Yum! What is the serving size in the nutrition info? Serving size is 1 tablespoon- there are 20 in a batch. Hi, I just made this and I agree that 1/4 cup lemon juice makes it too lemony. If you leave out the lemon juice you have to replace that liquid with another liquid, I’d use water. Also, I cannot use straight coconut oil so I used “Chosen Blend” which is a combination of avocado oil, organic safflower and coconut. It is a liquid oil and does not have a coconut flavor. It worked. I have to say that it never got as creamy as dairy cream cheese, it stayed gritty but that isn’t necessarily a bad thing. Oh, I too added a pinch of himalayan salt to cut the lemon flavor. I would make this again. Hey! Can I half the recipe? I only have one cup of cashews will go to the store later this week? Thank you! Just made it ! It’s great can’t wait for breakfast tomorrow! Now I have a full can of coconut cream . I don’t know what to do with it. Do you have any recipes that have coconut cream in them? Don’t wanna waste it. I was just wondering if this recipe can be turned into a veggie cream cheese once it’s all blended together? By let’s say adding peppers, green onion, carrots, etc. Hi Susan, that will totally work and be super yummy! In the recipe ingredient list is says coconut cream. But in the comments people are saying they used coconut oil. Which should I use? Hi Marci, I use coconut cream. You can try coconut oil, but I use coconut cream. Well I was wondering could. This be used in a cheese cake recipe? Hi Jean, I love using this recipe in raw cheesecake recipes! Do you have a substitute for the coconut cream, I have an allergy to coconut. 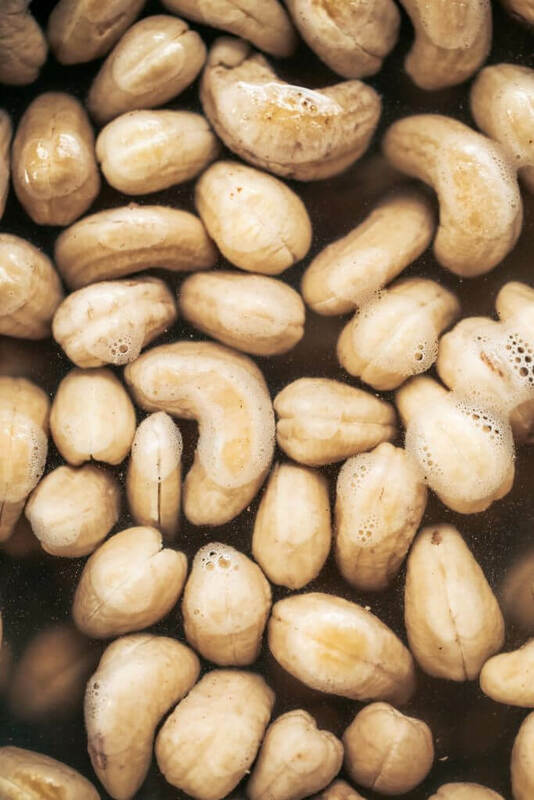 You can boil the Cashew for 30mins, drain & cool before pureeing. Works great if you don’t have time to soak overnight and it gives the smoothest texture ever. Will this work to freeze and thaw at a later time? I should’ve cut the recipe in half cut didn’t think to and I’m quite sure I won’t eat this much (nor should I! Lol) in a week. Hi Kim, I don’t think that would turn out the same… maybe, but the texture might be a bit weird once frozen? Hi, I have read some of the comments and some mention coconut oil, but your recipe calls for coconut cream. I have two questions, is it coconut oil or cream and if using either, can you taste the coconut? Does anyone know if this tastes like actual cream cheese? I want to use it for cucumber sandwiches and I feel like cashews would be weird with that. Hi Amanda, it can, but I suggest using it fresh for best results. Can this be done with fruit? Like adding strawberries possibly? Hi Haydin, adding fruit with this is tasty!